The proximate causes of the Colbert segment are two new revelations about the Sacklers. First, the family has claimed in the past that it is unfair to blame them for the opioid crisis, because their company Purdue Pharma’s flagship drug OxyContin accounted for a relatively small percentage of opioid prescriptions. But although they didn’t publicize it, it turns out the family also owns another pharmaceutical company, Rhodes Pharma, that sells generic versions of opioids, giving them a larger piece of the pie than they’d admitted. (Rhodes Pharma was founded in 2007, the same year that Purdue pled guilty to felony criminal chargesfor lying to doctors and regulators about OxyContin’s addictive potential.) The second piece of great news about the Sacklers was that Richard Sackler obtained a patent in January for a new drug to treat opioid addiction, so the family can make even more money from the people whose lives they’ve already ruined. 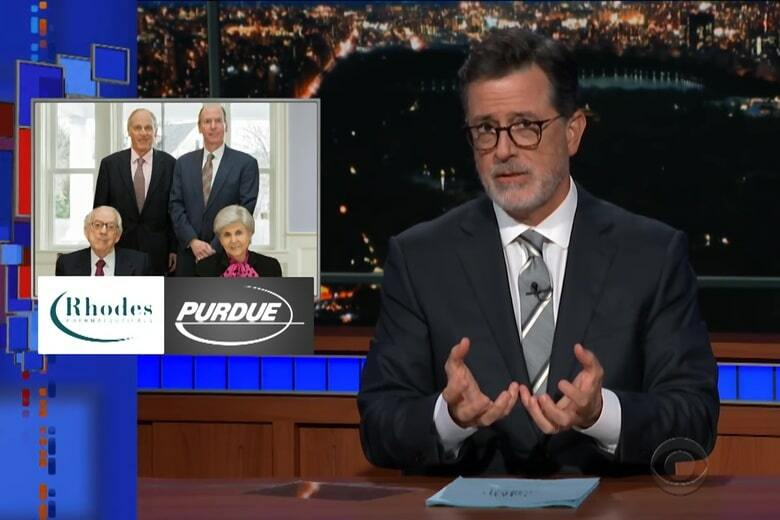 That—along with the Sacklers’ campaign to bring the wonders of opioid addiction to the rest of the world—was enough for Colbert to devote a network TV segment to their depravity.